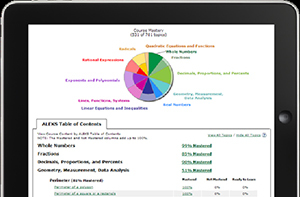 The math assessment platform includes learning tools that help students "relearn" material already covered before re-taking the assessment. McGraw-Hill Education has released an upgraded version of its ALEKS (Assessment and Learning in Knowledge Spaces) Placement, Preparation and Learning (PPL) platform. ALEKS PPL, first introduced in 2013, uses adaptive technology to assess students' knowledge and place them in the appropriate college math course for their level. It combines assessment with learning tools to help students "re-learn" material they have already covered before re-taking the assessment, and increases the likelihood they will be placed in higher-level math classes. Enhanced dashboard data reporting for administrators that is expected to help them easily identify students who may need additional instruction. Existing key features of ALEKS PPL include artificial intelligence designed to target individual student knowledge gaps and open-response, adaptive assessments that cover multiple topics in 30 questions or less. Assessments cover math courses from basic math through calculus 1 and provide up to six months of personalized learning and remediation when needed. "Historically, placement tests used by colleges have been inaccurate, unreliable and failed to take advantage of modern adaptive technology that can provide directed learning to help students prepare for subsequent assessments," said McGraw-Hill Education Higher Education Group President Sally Shankland. "ALEKS PPL enables institutions to redesign their placement programs, turning a traditionally one-time, standardized test into an opportunity for students to earn the ability to take courses most appropriate for their skills." For more information, visit the ALEKS site.